With Val off to keep her new owner happy, I was free (and funded!) 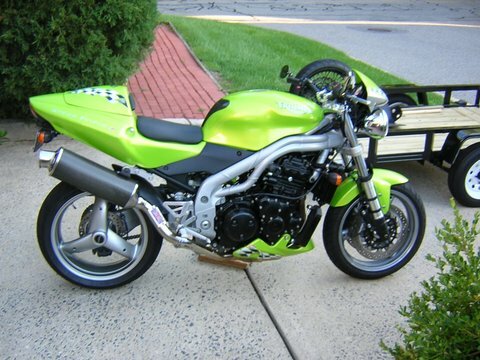 to find ‘the bike’ to replace the VFR. 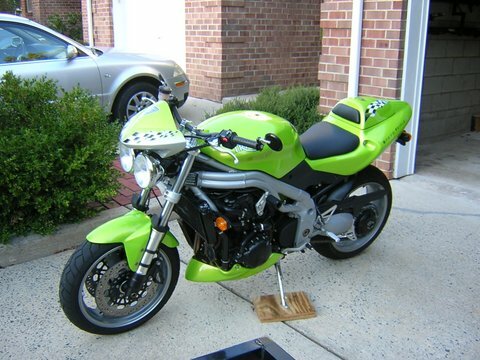 I already knew it would be a Triumph Speed Triple, and thought I wanted something in the ’97-’02 age range. I had my personal reasons for that; but the fact is the ’03-’04 had significant improvements. The one thing that I kept as a criteria is the color. Doe loved the ‘peridot’ color (which Triumph calls ‘Roulette Green’), so I looked – and looked hard – on eBay, CraigsList, and posted ‘WTB’ ads on all the Triumph forums. She’s pretty much ‘mint’, and equipped with all the goodies! ‘Roulette Green’ is a spectacular color, even better in person. She’s near Des Moines, Iowa at the end of the day today. It’s even possible she’ll be here next week!